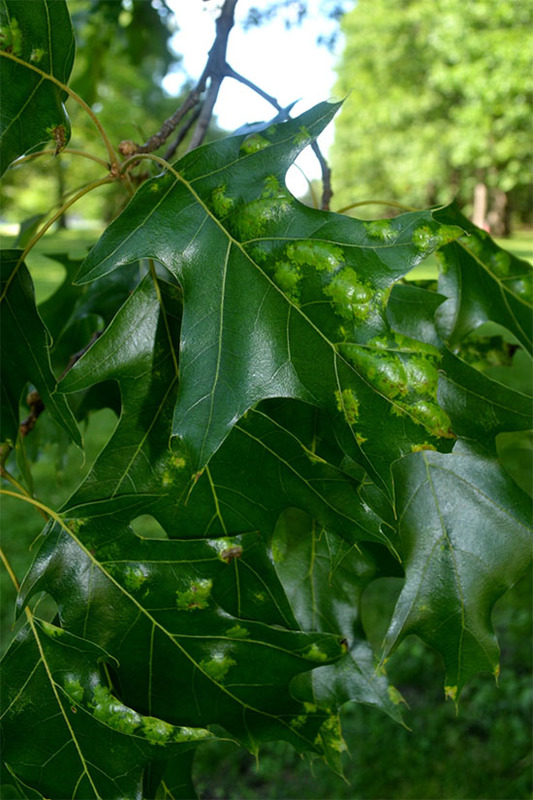 Oak leaf blister has started to appear on oak trees on the Illinois. This disease is caused by the fungal pathogen, Taphrina caerulescens. Members or the red oak group are more commonly affected by the disease. Symptoms are distinctive, and appear as scattered blister-like, puckered, or raised areas on the leaves. Affected areas appear concave or sunken in on the opposite side of the leaves. Symptomatic tissues are often thickened and have light green color which transitions to reddish-brown as the season progresses. Severely diseased leaves may drop prematurely. Oak leaves with early symptoms of oak leaf blister caused by the fungal pathogen, Taphrina caerulescens. The pathogen survives over the winter in buds and on twigs. Infection occurs early in the spring during cool moist weather as the buds start to swell and open. Damage to trees in Illinois is mostly aesthetic and the disease is generally not considered to be a significant landscape problem. Management should focus on promoting oak tree vigor through pruning, watering, and fertilization. Though not usually warranted or recommended, several fungicides are labeled to control oak leaf blister. These products are only effective if applied as a dormant application to buds and twigs.